High monthly monitoring fees: Standard monitoring plans for new customers range from $36.99 to $52.99 per month. This is a bit higher than other leading industry providers. Specifically, their lowest plan is considerably higher than other industry leading providers and their respective lower plans. A long, 36-Month contract: ADT provides the installation and equipment free of charge, but with one major caveat. You’re basically signing a 3 year (36-month) contract. Also it’s important to note that these contracts aren’t too forgiving. Customers are expected to pay what they owe on the contract in the event that they try to cancel early. Video surveillance option: ADT has a video plan option where for $49.99/month, you get the standard home security package along with a camera that includes video surveillance features that you can monitor through the ADT mobile app. 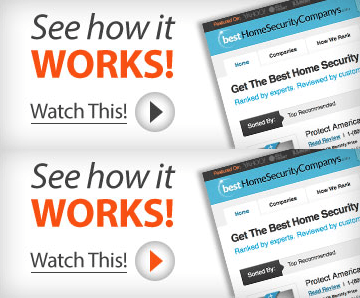 Most home security service providers still do not offer video surveillance as a service. So if this is an important feature to you, you’ll want to consider ADT. Customer service complaints: Common complaints of ADT customers include sales and installation reps failing to show up to scheduled appointments, long wait times, and high cancellation fees. We have received over 1,500 negative reviews here on this website regarding ADT from real customers. Our recommendation: Despite being the industry’s most well-known name and arguably its largest institution, we recommend other more inexpensive and more customer-oriented home security providers. We suggest looking into companies like Frontpoint Security and Protect America. Call our recommended rep over at ADT below. customer reps work hard, system seems fairly reliable, but for the last two days I have been besieged by false alarms in the form of internal warning beeps. We had a service rep come and installed some new equipment and the problems actually worsened, the false alarms sounded external sirens. It is now 2am on the third day and I have little hope of getting any sleep. My neighbors and I are becoming convinced that ADT does not provide dependable equipment and willing but ineffective service. I am seriously considering switching suppliers. My home was broken into. The alarm system was ripped from the wall and it did not trigger an alarm notification to the monitoring center. I came home to a broken front door and a loss of close to $20K in jewelery. From there it was a nightmare. ADT spent a week trying to prove that I had not armed the system, which was wrong. I couldn’t get my case escalated to someone who could help me. Then they re-installed the system and it is currently held together with tape. I have the pictures to prove it. In all of this, they claim there is no admission of liability! I have been trying to get this resolved for months. They offered to pay my insurance deductible, of course after I submit a bunch of paperwork. Then they had the nerve to offer me an upgrade to a more current system! With this level of service, how can they possible expect me to continue as customer? I say – stay away. ADT is a fraud! We were told over the phone not once but twice that we would be entering a 12 month contract and after 12 months we tried to cancel and was informed we’d signed a 3 year contract. I talked to the customer service rep who was rude and asked her to listen to the recorded conversation and she stated that it did not matter what was said as long as we’d signed the contract. And we’d have to pay $870 to cancel. They also told us that our system would come with cameras but upon installation was told we’d have to pay $300 more dollars. After we fussed they stated they would give us $200 in visa gift cards that never came in the mail. After talking to the rep about cancellation she stated we needed to send in paper work before receiving the $99 gift card. This whole deal was a rip off from the start!!! RUN don’t walk! I’ve been a customer with ADT for over 15 years. Each year resulted in an increase. Never flat, never went down. To the point I went from about $20 a month to $55 a month. I estimate I’ve paid them between $5,000 to $10,000 over that time. I found a service for $9.95 a month that does the exact same thing. As I switched, they said they could drop me down to $14.99 a month for six months or $27.99 a month if I sign a contract. Wow, one phone call and I get a dramatic drop….really??? Not one year did they hold my monthly fee steady. And when I needed a new battery which costs $25, they told me that I was out of luck and had to buy it myself or pay them $200 to replace it….really. Last of all, they said I had to pay for another 30 days…..really. Glad to say goodbye. At least I got to keep the equipment. We had ADT install our equipment and provide our monthly service. There was not a problem until we sold our home. We called ADT to put them on hold until we purchased a new home. We paid $100 to hold our service since we had not fulfilled the 3 year contract. (which I was not told about- but I will chalk that up as my fault since I did not thoroughly read the contract, and just took the word of the installer) The new buyers of our home called ADT and began a new service with them. Their first monthly charge was put on our credit card. I could not find anyone at ADT that could fix the mistake, so I had to cancel my credit card to avoid future billings on my card. Finally someone I spoke to, after a month of calling, figured out the mistake and credited my account. A couple of different times, we have had agents call to see if we were ready to begin our new service to which we told them we were in the process of buying a new house, but have not finalized everything yet, and our closing date for our new house is set for the end of February. However, today we received a call from collections stating that we owe ADT $700 because we have not started back up with them. We had just talked to a representative a few days ago and told her that the new house was under contract and we would be calling soon. NO MENTION FROM HER OF A $700 BILL GOING TO COLLECTIONS BECAUSE WE HAVE NOT STARTED BACK UP WITH THEM YET!! Needless to say, I am FURIOUS!! I paid the $700 to keep it off of my credit report, BUT they will NEVER get my business again!! Signing a contract with ADT has been a horrendous experience. I literally chose them because they offered the exact same features as other local providers but they promised a $100 rebate. Be warned – the rebate is an absolute scam! There is no actual customer service, just a person named Brian Eaton at 800-575-4939 ext 7503 that sends you a rejection letter. I followed all of the rules, including signing up by clinging the rebate link. Not sure what else you need to do. Do NOT go with ADT if you are enticed by the rebate. it is untrue and they will not listen to their customers. I have tried to get information on this, out of principal, and nobody will do anything but pass my call along. Bad company; will terminate my contract the moment it is up. The worst service I have every had. Problems with the back up battery going dead and the key board going bad. They have been out 12 times in a year and half to try and fix the problem . But this is it the alarm went off at 12:30 am and would not shut off. We called the said there was a bad battery in one of the contacts for the window. They would come out for a charge and we told them you were just out here 2 weeks ago and the tech changed them. So good luck with the worst service. They are the worst company to deal with. I have had my system for about a year and a half and have had nothing but problems with it. The come out and fix the problem and then it comes back again and again I am so over it. I didn’t want it but my wife did she said it made her feel safe what a joke. We just had a technician out less then two weeks ago change all the batteries in the contacts and then at 12:30 at night the Alarm goes off. We called and they said that one of the batteries was dead in on of the window contacts that they just changed. Then they said for them to come out it would cost us money. They never fixed the real problem they just keep changing parts. How could anyone feel safe with them. Then my wife called one other time and gave them her phone number and they told her that they had nothing associated with that number she has had that number for 12 years. My alarm goes of in this month 5 times and didnt received any call to find out if me and my family is still alaive, all i got was a small letter in my postbox that said, cant access premisis. And that after half hours time. So if im somone kept us hosted inside they wont come and help us because no access and dont know why they cant give us a call. Then its another empty promise. That’s pathetic!!! And even after this message, I bet you still wouldnt give me a call, u know why? You just dont care about your costomers, only waiting to deduct your payment end off the month every month. Well that was the last payment you get from me and also my family and friends. Want everybody to see how bad ADT service become. Hope you have a good day now. This is the message I sent to ADT when cancelling my service. It explains it all. Honestly I haven’t had a good experience with ADT at all. First, I just learned to read contracts more thoroughly, because my sales rep told me it was a two year contract. That’s on me, I should have paid more attention, and not trusted his word. Then when sensors would randomly set off or wouldn’t work, my rep was no where to be found (literally called him multiple times and never heard from him again, so you guys assigned another rep.) They promised me the doorbell camera, and after signing and coming for installation, they told me they couldn’t set it up. I finally at least got the sensors working and the cameras were useless and would constantly record trees moving but would somehow miss people walking right up to the front door, because that’s logical. They sent someone to fix that as well but it never worked like the rep demonstrated. System would go offline if the WiFi did, which was such a pleasant chirping noise during Hurricane Irma until I finally figured out how to shut it off. Overall the equipment is cheap, my grandmother has one of your old systems and it’s incredible but the new stuff cut too many corners especially for the steep price. I have no use for it now, so I would rather pay the $1,111.68 cancellation fee and get this partnership over with. This has nothing to do with the service you personally provided, but ADT to this point has been a complete waste of money and I would warn everyone not to use your products. Product does not work. Cameras do not record movement most of the time. Paul’s system seems to be down a lot . Very dissatisfied with the product and the service. I would never ever use ADT to provide my home or business security. They advertise one product and when the salesperson/installer comes they tell you this or that is not actually included in the advertised offer. They are sales people who make their money off you by upgrading different sensors, etc. I ended up paying $20+ more than the advertised. The salesperson assured me that if I moved out of the country where their service was not offered that I could cancel without penalty. That is a lie! After 1 year, I was transferred to Mexico, and when I cancelled, they initially wanted to charge me $1000. Eventually, they offered me a $500 buyout of my contract. Forget getting to corporate to complain. It’s a circus and the bottomline is they want your money regardless of what the salesperson may have told you. READ and KEEP your contract before and after you sign. Better yet, DO NOT SIGN UP WITH ADT. Wow, just wow! Called to cancel my service today due to budgetary restraints. The woman went into a tale of how tough it is to be a grown up and face these harsh realities of budgeting. She then went in to a hard sell to keep me a client and I told her my mind was made up. She asked me what I would do to protect my house. I told her it’s none of her business and I want to talk to a manager. I’d had enough! Simply wanted to discontinue service. She put me on hold to get a manager and then came back and said the manager told her to just proceed with canceling my service- yea, right. If I ever can afford another service, it won’t be ADT! The service tech, John, that came out on 1/25/18 was deceptive. After he took the tour of my home and came back with the proposal of what I “needed” he showed me the invoice sheet. Not at any time did he explain to me that I would be paying $1200 up front. From my understanding the “total investment” charge was included in the monthly fee, which was also higher than initially quoted. He also never asked if I was okay with the higher prices, he just started the install. After he was finished and we started going over the paperwork, it was only then that I was told I had to pay $1200 right away. I gave him my card number and told him to wait a moment while I called my husband. While I was out of the room, he went ahead and charged my card for the full amount of $1402.58. When I told him that we no longer want the system and I want my money refunded he gave me a packet and circled a phone number to call. He told me I would have to call them in the morning, because they were already closed. He said I could instantly get my money back in the morning. After he left I looked at the number and it said that they were open. So I called right away and spoke with a customer service agent. I told her what had happened and she apologized and said my refund and the removal of the equipment would take at least 15 days. That is completely unacceptable. I was lied to, taken advantage of, stolen from, and blamed for not understanding the contract because my 2 small animals were distracting. I also had a friend in the room with me the entire time he was there. She never once heard him explain that I would be paying upfront. I am extremely disappointed in the way ADT represented themselves. I would have NEVER agreed to pay $1200 upfront if I had known. John did not in any way, shape, or form explain to me that money was due upfront. The sales agent I initially spoke to while setting up the appointment never explained that to me either. John also told me that the $99 install fee, was just a fee that was just charged just in case I canceled the appointment. So again I was lied to. The business practices at ADT are disappointing. The service techs and sales agents need to tell new customer that there will be charges made upfront. John should have NEVER ran my card when he was told to wait. I was excited to have a home security system put in place to protect my family, but in doing so I was robbed anyways. My family and I will gladly take our business elsewhere. This company coerces you into signing a 3 year contract! Plus, if you want to get out of the contract it will cost you $1000. This company lied to me about transferring services when we moved to a new house and instead I was forced into signing a new 3 year contract, which is the exact opposite of what I wanted to do. I tried calling the company and the only thing they did was lower my monthly payment by $10 for 6 months only, just awful service, especially for someone who used their services for 2 years, and then you get treated like dirt when trying to figure out an issue. I would NEVER recommend this company or their services to anyone I know! Bad company. Stay away. They don’t tell you they lock you in for 3 years. They over charge my acct 2 times. They took 2 payments for one month then you have to wait 10 days for your money back. ADT is crap. WHEN I MOVED, I PAID A FEE OF OVER 100 DOLLARS. I TRIED REPEATEDLY TO CONTACT THEM AND GET MY SERVICE MOVED..AFTER CALLING A LEAST SIX TIMES, I WAS STILL PAYING THE CHARGES FOR MY OLD HOME, WHICH HAD BEEN SOLD. I HAD TO CHANGE MY BANK ACCOUNT TO STOP THE CHARGES. NOW IT IS ON MY CREDIT REPORT AND THE SERVICE STILL HAS NOT BEEN TRANSFERRED. FIND YOUR SECURITY SOMEPLACE ELSE – NOT ADT!